Unfortunately, parking has always been a major concern for truckers. Wedged in a small parking lot, or illegally parked on the side of the road, options for parking have always been slim for semi-trucks. Thus, enabling the creation for a new system called Trucks Park Here. This is a high-tech program created by the Iowa Department of Transportation (IDOT). This program gathers current data at state-run rest stops and privately-owned truck stops. It lets commercial truck drivers know when and where real-time parking spaces are available. This app is most prominent along the I-80, I-380, I-35, and I-29. Currently, only Ohio and Minnesota have programs that establish a live feed for parking. By the end of the month, so will Iowa. This real-time data app will ensure that parking maps are continuously updated. Therefore, information provided includes which sites have parking available, low availability or closures. Interestingly, this program is in conjunction with many other mid-western states to develop a larger transportation network for truckers. This new program is called the Truck Parking Information Management System (TPIMS). So far, along with Iowa, the program includes seven Midwest states: Kansas, Indiana, Kentucky, Michigan, Minnesota, Ohio, and Wisconsin. So what exactly does this program do? The new system puts safety above all else. 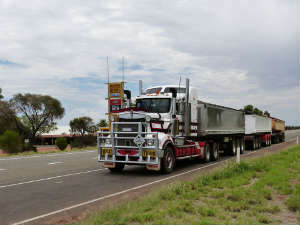 Stopped semi-trucks can cause irregularities in traffic and hazards for drivers. Sadly, finding safe and available parking is a growing concern among truck drivers. According to IDOT, more than 83% of drivers spend about 30 minutes looking for parking. Combine this with inadequate rest and a driver’s hours of service coming to an end, they need immediate parking solutions. Trucks Park Here will provide drivers with a variety of in-pavement and parking lot entrance and exit sensors with the knowledge of a full lot ahead of time. Also, magnetometer pucks installed in parking spaces at truck stops will detect the presence of a semi-truck. It feeds to the Trucks Park Here website and enables the program to collect data on trends. When the program is complete it will collect information from 44 sites. These sites include weigh stations, privately-owned truck stops and public rest areas. So, are you excited about a predisposed parking spot for your rig?